1 serving contains 150 mg of the rare omega-7 fatty acid. Helps replenish and retain proper eye moisture. Relieves occasional dry eyes due to sun, wind, contact lenses, aging, personal electronics, or computer use. Clinically studied SBA24® is a blend of sea buckthorn seed and pulp oil extracts. Recommended Use: 1 softgel daily. May increase as desired. Q: Are there any contraindications for using Omega7® Eye Relief™ along with eye drops? A: No. 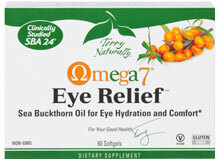 The rich sea buckthorn extract of Omega7 Dry Eye Relief helps support healthy moisture levels from within. It does this by nourishing the delicate film that protects the eyes. There is no reason that you cannot use this product if you also use eye drops. Q: Is Omega7® Eye Relief™ recommended only for eye support? Q: What is “supercritical CO2 extraction” and why does it matter? Is it natural? A: Many supplemental ingredients are produced using harsh solvents such as hexane to separate the extract from the plant material in order to concentrate its benefits. Supercritical CO2 extraction uses a different method. While this method is not perfect for all types of plant extracts, it is superlative for sea buckthorn. It uses carbon dioxide in liquid form, which is odorless, tasteless, and non-toxic. Oils in plants that are extracted using this method contain no heavy metals, are pure and safe, provide no base for germ growth, and need no preservation. Supercritical CO2 extraction works at very low temperatures, preserves sensitive plant constituents, and avoids the risk of biologically active components being destroyed by oxidation. CO2 extracts are 100% natural, authentic, highly concentrated and offer the user the highest level of key active constituents found in sea buckthorn. Omega7® is a registered Trademark of Aromtech, Ltd.